A look at the special episode. Spike Chunsoft has released a trailer introducing the Super Danganronpa 2.5: Nagito Komaeda and the Destroyer of the World anime included with the limited edition of New Danganronpa V3: Everyone’s New Semester of Killing in Japan. Nagito Komaeda is an ordinary young man who attends an ordinary school. He’s not comfortable being the protagonist of the story and feels that special abilities just get in the way of one’s happiness. 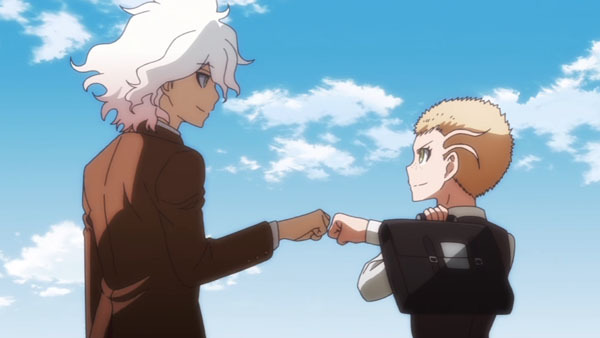 As he observes his classmates going about their ordinary teenager lives, he’s so convinced that a moderate lifestyle will lead to moderate happiness that he makes an impassioned speech to Fuyuhiko Kuzuryuu, who is in the same year as him. But then one day, a boy calling himself “Destroyer of the World” appears and begins tearing Komaeda’s world apart.